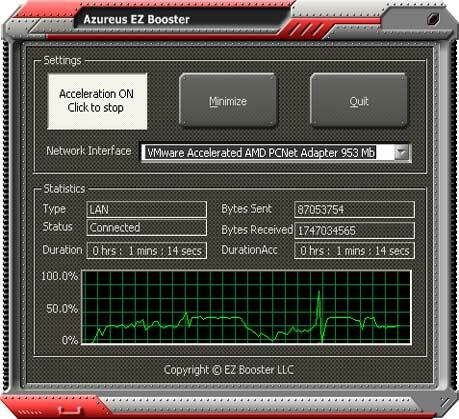 Azureus EZ Booster - Azureus-Ez -B helps your download speed. Tired of sluggish downloads? Azureus-Ez -Booster is an excellent plug-in for Azureus client. All the features of Azureus are taken to the next level of efficiency with this program due to its modern architecture specially designed to obtain high speed downloads and enable advanced searching for sources. Moreover, Azureus-Ez -Booster does a great job against Internet congestion and bad connection. At last, you will be able to use the bandwidth at its full capability. Azureus - EZ -Booster is offered FREE of charge! System Requirements: -Azureus installed; -Windows 95/98/98SE/ME/NT/2000/XP/Vista/7; -Internet connection.